Vasile Maftei, 30 years old. 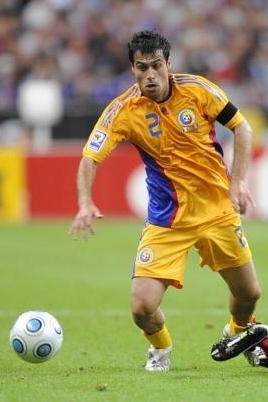 My view: Excellent example for Romania’s lack of options at right back in the national team, with a winner who has been playing as a centre-back until two years ago and the only other Romanian in the top five – a below average 32 years old like Popete, who relegated with Pandurii at the end of the season. In such a mediocre company – Tony could have done more, but has rarely played for CFR, while Dananae from Universitatea Craiova was out for a long, long time, after a severe injury -, Maftei fully deserves to take this. My choices: I’m honestly surprised to see FC Vaslui’s Milanov missing the top five (affected by Gazeta’s marks and the bonus system that involves the team’s performances, not just the player’s), who has been very consistent, has adjusted immediately after his transfer and was as impressive on the right, as he was on the opposite flank. Rapid had two good right backs, Helder and Sapunaru (why in the world was this guy left out from the national team? ), I would have liked to see more Craiova’s Barboianu on this position, as he was used too much as a defensive midfielder, but everyone’s mad this summer about Otelul’s Cornel Rapa.